Normal Radius Bends (1.5D) available in a wide range of sizes, 1" to 4". Bends available in 30/45/60/75/90/135/180 degree (in most cases). Tight Radius Bensd (1.25D) also available in 2.5", 3.0" and 3.5"
Other bends available on special order. Wall thickness depends on pipe size. Please refer to the price list for more information. 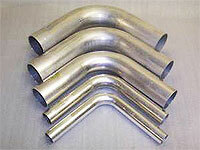 Aluminium pipe is 6000 series hardened pipe perfect for strength, welding and anodising.